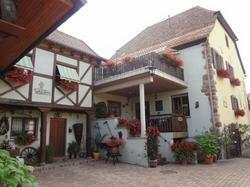 This hotel is located in the centre of Bebleheim, in the Alsace vineyard region, just 3 km from the medieval city of Riquewihr. It features a terrace with a summer garden. Each guest room at the Hôtel La Bergerie is individually decorated. They are equipped with flat-screen TVs, fridges and private bathrooms. La Bergerie provides bicycles free of charge for exploring the surrounding area. There is also a free garage for storing bicycles and motorcycles and a free public car park is available nearby. Hôtel La Bergerie is 5 km from Ribeauvillé and its 3 castles and 7 km from Ammerschwihr golf course. Colmar is 13 km away. Please note that the reception closes at 18:00. Guests arriving after 18:00 are kindly asked to contact the hotel in advance. Contact details can be found in the booking confirmation. Consists of 1 bedroom, 1 bathroom and a living room with a sofa bed, flat-screen TV and a fridge. The Family Room is made up of 2 bedrooms. Rooms have been individually decorated and include a flat-screen TV. A refrigerator and a private bathroom are also provided.